The report titled "Turkey Baby Food Market Outlook to 2023 - By Infant Milk Formulae (Standard, Follow-On, Growing-Up and Special Baby Milk Formula), Dried Baby Food, Prepared Baby Food, Milk Formula and Other Baby Food; Organic Baby Food" provides a comprehensive analysis of the baby food market in Turkey. The report also covers ecosystem of the market, stakeholders, market overview and genesis, value chain analysis, market size in terms of revenue, segmentation by food category, nature, age group and channels of distribution, trends and developments, issues and challenges, snapshot on emerging baby foods, decision making criteria for consumers, government regulations, SWOT analysis and competitive landscape. The report then concludes with market projections for future market described above and analyst recommendations highlighting the major opportunities and cautions to be taken before entering the market. Turkey Baby Food Market Overview and Size: The baby food market of Turkey is in its growth stage. The market displayed a strong competitive scenario where international players that hold majority stake are trying to sustain their existing market share while domestic players are trying to increase their market penetration. The baby food market of Turkey is primarily import oriented in nature. It is also very receptive to newness and innovations for instance, application based baby food i.e. baby food designed specifically for infants dealing with various body and health issues have gained a lot of popularity in the country. Goat milk formula products were also witnessed to emerge during the review period. Despite the fact that government is encouraging breast feeding among new mothers, the baby food market displayed consistent growth over the years. By Food Category (Dried Baby Food, Prepared Baby Food, Milk Formula and Other Baby Food): Milk formula is the most conventional baby food product in the market and is considered as the next best alternative to mother’s milk. It was analyzed to be the leading segment with a considerable revenue share during the historic period 2012-2018. 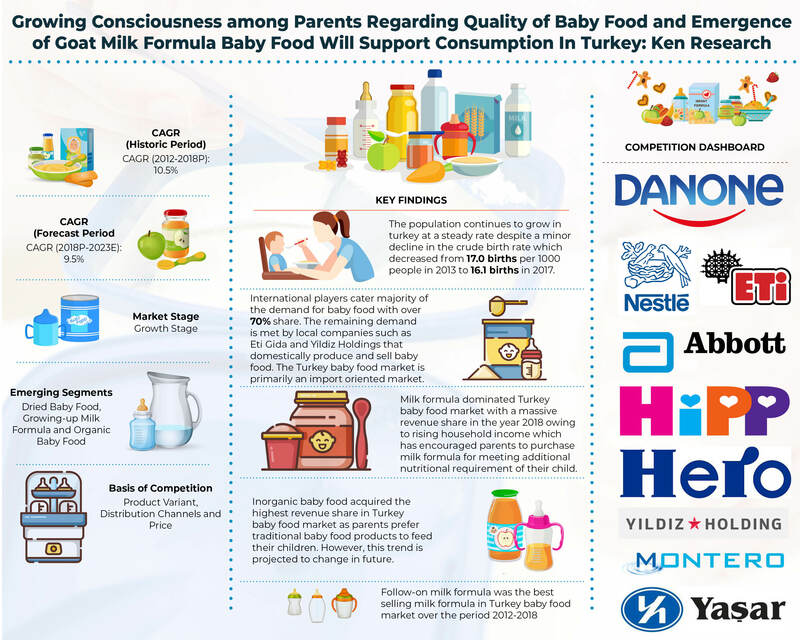 By Type of Milk Formula (Standard Milk Powered Formula, Follow-on Milk Powdered Formula, Growing-up Milk Formula and Special Baby Milk Formula): Majority of the sales in Turkey baby food market were of follow-on milk powdered formula products. This was followed by growing-up milk formula, standard milk powdered formula and lastly special baby milk formula. Special baby milk formula is primarily required by infants with special nutritional needs or they are allergic to some specific ingredient. By Organic Food: In Turkey, the majority revenue share was held by inorganic baby foods because inorganic items cost much lesser than their organic counterparts. By Age (0-6 Months, 6-12 Months and 12+ Months): The baby food product segmentation by age groups is only out of milk formula and doesn’t include other baby food categories such as dried baby food, prepared baby food and other baby Food. The leading category was in this segment was infants in the age group 6-12 months. By Channel of Distribution (Hypermarkets, Supermarkets, Independent Small Grocers, Health and Beauty Specialist Retailers, Other Foods Non Grocery Specialists, Internet Retailing and Discounters): The supply of baby food in Turkey is majorly through offline stores such as supermarkets. Subsequent purchases after consulting health experts are made from these renowned and trustworthy megastores. Presently, Internet retailing channels like e-commerce websites, company websites, baby products’ specific websites and websites of offline stores account for a very low share in the distribution of baby food in Turkey which is projected to change in future. Competitive Landscape: Competition within the Turkey baby food market was observed to be highly concentrated with the presence of 5 major international players and 5 major domestic players competing on parameters such as product variant, channels of distribution and price of the product. The leading players in the market are international companies that directly import finished baby food products in Turkey or have their local production facilities in the country. The domestic companies selling baby food products acquired minority market share. Companies such as Danone Group and Hero Group GmbH acquired majority market share. Turkey Baby Food Market Future Outlook: During the forecast period of 2018-2023, it is anticipated that the baby food market of Turkey will grow at a significant CAGR. The demand for conventional milk formula is expected to fall whereas the demand for dried baby food is projected to rise. The demand for follow-on powdered milk formula is expected to decline while for growing-up milk formula, it is expected to increase. Organic baby food sales are expected to significantly grow owing to increasing health awareness among parents and rising household income in Turkey. Table 8-5: Cross Comparison by Type of Milk Formula (Standard Milk Powdered Formula, Follow-On Milk Powdered Formula, Growing-Up Milk Formula and Special Baby Milk Formula) including Target Audience, Channels of Distribution and Major Brands, 2018(P).